What’s It About? Angelina Jolie directs the true story of Louis Zamperini, an Olympic athlete who was taken as a Prisoner of War by the Japanese during WWII. Jack O’Connell stars as Zamperini as we follow his life from the Olympics to a prison camp, via being stranded in the Pacific Ocean after a plane crash. Unbroken also stars Domhnall Gleeeson, Garrett Hedlund, Jai Courtney and Miyavi. Verdict: Zamperini’s story is absolutely incredible, and it’s shocking nobody made a movie about him before (various projects had been planned in the past, with Tony Curtis and Nicolas Cage amongst others attached). The story is also inherently cinematic, ticking all the ‘inspirational’ boxes for an epic awards-worthy movie – but is the movie as good as the story it is telling? Jack O’Connell is pretty well known to most British audiences by now – this year alone he’s appeared in Starred Up, 300-Rise of an Empire and ’71 already, but this is the film set to make him a huge Hollywood star. Playing an American, his accent is decent and, once you’ve got used to seeing him with black hair, he inhabits the role brilliantly. Like Tom Hardy, he is capable of saying a lot purely with his eyes, and in this case he gets across his determination and spirit, in a very restrained but accomplished performance. The physical transformation alone – from youthful, clean-cut athlete to dishevelled, dirty and skinny POW is an amazing journey – O’Connell has put his all into this. This isn’t a perfect film (which we’ll come onto), but the reason for this is definitely not the acting, all of which is excellent. Alongside O’Connell, the real stand out is Miyavi, who plays Watanabe, the prison camp leader and the film’s chief antagonist. He’s electrifying when on screen, and scenes between Miyavi and O’Connell are the film’s best – and extremely tense. Angelina Jolie creates tension expertly throughout, in this, her second directorial feature – if it’s not the threat of torture it’s the sharks that come before it, with scares as good as any in Jaws. Back to the acting, and there really is no weak link – Domhnall Gleeson is as reliably brilliant as ever, and also looks shockingly underweight in a couple of scenes. Garrett Hedlund also puts in a career-changing performance as John Fitzgerald, the leader of the prisoners in the prison camp. Prison camp scenes are reminiscent of the recent The Railway Man, but Unbroken is the far superior movie. The former did have some effective POW scenes, but they were nowhere near as brutal or graphic as what we see here – we do see a lot of brutal whippings and prisoner abuse, which is likely to stay with you as the abiding image of the film. These scenes are very difficult to watch, and rightly so, but there are rather a lot of them, leaving these as the lingering images of the film instead of the inspirational spirit of Zamperini – towards the end they really aren’t showing us anything new, just more of the same. Still, there have been prison camp scenes in many classic Hollywood movies, and this does have the feel of one of those. The film begins aboard a plane that comes under fire, with bullets tearing apart its paper-thin shell. This is really exciting, tense and thrilling, but is something of a false start as we then go back to Zamperini’s childhood. These establishing scenes probably didn’t need to be shown, especially with so much else to fit in, and they really do slow the film down before we get to the far superior ocean and prison camp sections. The film is well put together by Jolie, but doesn’t have quite enough confidence in its audience not to spell things out a little too much, such as the overly-preachy ‘love your enemy’ sermon young Louis sits in at the beginning of the movie. Aside from the early flashbacks, though, the film keeps it simple but there really is so much to cover that it is hard to fit it all in to a movie comfortably. Final Words: Unbroken is a film that strives to be epic and truly great, and rightly so considering the incredible story upon which it is based and the talent involved. The performances are excellent, especially O’Connell and Miyavi, but in all it doesn’t quite reach the mark. Jolie has put together a very good film, but one which is over-preachy at times and spells things out a little too clearly to the audience. The strengths of Unbroken far outweigh the weaknesses, and it’s great that more people will learn of the story of Louis Zamperini. 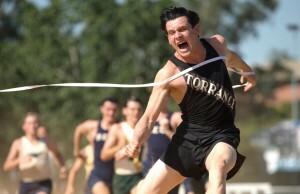 Unbroken (15) is in UK cinemas on 26 December 2014.